We Stand FIRM: Hsieh PJM OpEd: Will Tomorrow’s Medical Innovations Be There When You Need Them? Hsieh PJM OpEd: Will Tomorrow’s Medical Innovations Be There When You Need Them? PJ Media has just published my latest OpEd, "Will Tomorrow’s Medical Innovations Be There When You Need Them?" My basic theme is that we must protect the freedoms necessary for the advancement of medical technology. How much has American medicine changed in the past 30 years? Let’s turn the clock back to 1983. A middle-aged man, Dan, is crossing the street on a busy midday Monday. An inattentive driver runs a red light and plows into Dan at 45 mph, sending him flying across the pavement. Bystanders immediately call for help. An ambulance rushes Dan to the nearest hospital. In the ER, the doctors can’t stabilize his falling blood pressure. They prep him for emergency surgery. The trauma surgeon tries desperately to stop the internal bleeding from his badly fractured pelvis but is unsuccessful. Dan dies on the operating table. Fast forward to 2013. Dan’s now-grown son Don suffers the same accident. But within minutes of his arrival in the ER, he’s sent for a rapid trauma body CT scan that shows the extent of the pelvic fractures — and more importantly, shows two badly torn blood vessels that can’t be easily reached with surgery. An interventional radiologist inserts a catheter into the femoral artery in Don’s right leg. Watching live on the fluoroscopy screen, the radiologist skillfully guides the catheter through the various twists and turns of the arterial system and positions it at the first of the two “bleeders.” From within the blood vessel, he injects specially designed “microcoils” into the torn artery and stops the bleeding. He then guides the catheter to the second bleeder and repeats the procedure. Don’s blood pressure recovers. The surgeons now have time to repair Don’s pelvic fractures and other internal injuries. For more, read the full text of "Will Tomorrow’s Medical Innovations Be There When You Need Them?" 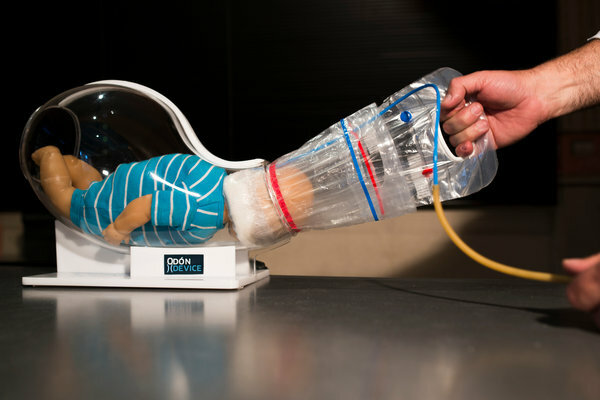 Update #1: A great example of medical innovation coming from unexpected places was this 11/14/2013 New York Times article describing how an Argentinian car mechanic saw a Youtube video on how to extract a stuck cork from a wine bottle and realized it could also be used to help extract babies stuck in the birth canal. Update #2: For those interested in the real-life technology used in the fictional scenario I discussed, here's a nice medical slideshow from UCLA interventional radiologist Dr. Justin McWilliams, "Life-saving Embolizations: Trauma and GI bleeding"